When it comes to training, there’s nothing more intense than boot camp. Since the days of ancient Sparta, almost every society on earth has used brutal initiation to turn average citizens into warriors. One look at history, and it’s pretty hard to ignore the results. More recent times have shown the application of boot camp’s principals for more peaceful pursuits. The civilian world has used military training as a model for fitness programs, fraternity initiation, and reality TV. Anthropologists have linked this fascination to a lack of rites of passage in modern society. But what can we, as training professionals, take away from boot camp? Let’s see. The military isn’t just a job, it’s a community and a way of life. Military training transforms individuals at every level and introduces them to a new society with its own customs and rules. ‘Boot,’ as soldiers often call it, cements bonds that make those who survive the ordeal closer than family. In the civilian world, team bonding should be a part of any effective organization. This is why we have overnights, outings, drink-ups, and team-building exercises. Far from distractions, these events serve as vital training in team culture. This is how you form a tribe and foster an inclusive environment. Training needs to give learners the feeling that they’re not going this alone, but that they are becoming part of a community. The first step in basic training is to make everyone look the same, usually that means a common uniform and haircut. 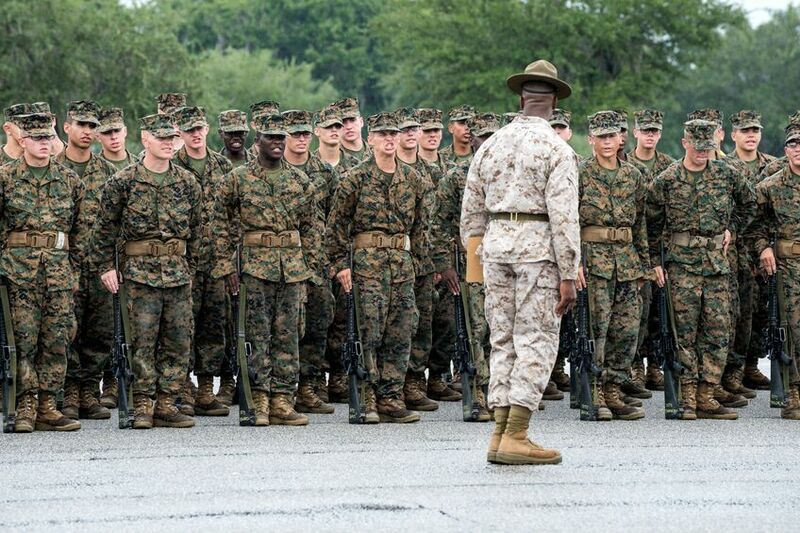 Marines are forbidden from referring to themselves as ‘I.’ That is because the ‘I’ no longer matters. Each recruit is there to be made into something other than what he or she was before. This may sound stifling, maybe even a little scary, but in a training context, this point is more about getting everyone pulling in the same direction. Branding, policies, procedures, commitment to the customer, etc. are all crucial aspects where your company depends on consistency amongst your employees. If you want total commitment from your team, it’s easier to ask for it from day one. Quality control is not an afterthought, it comes from the DNA of your workplace. The only way to build a new human is to break down the old one. Not everyone is going to make the cut, and it’s a fine line between breaking recruits down in order to build them up and simply breaking them. Some businesses can afford to have a brutal proving phase for new hires, and some don’t mind getting a reputation for high dropout rates. A sense of having gone through the training together can make for a strong sense of camaraderie and purpose. But some people will just walk away. High stakes sales departments are notorious for bringing in waves of aspiring new salespeople, and putting them through a make it or break it orientation that can sometimes last up to a couple months. Because of the cost to let a recruit go after investing in their training for months, it is critical to ensure the training approach and materials are the right balance to ensure the highest probability of success. Boot camp is great for teaching rules and discipline, but when it comes to difficult skills like parachuting and operating nuclear submarines, the military prefers to use ‘schools’ that don’t involve so much shouting. For instructing civilians, the same rule applies: the content of your training has everything to do with how you deliver it. Technical and creative skills aren’t really suited for a boot camp teaching style. Rules and policies, on the other hand, are ideal themes for group exercises. Waking up early, running countless miles with a loaded pack, pushing out thousands of pushups, enduring cold and discomfort, all while getting screamed at and called horrible names. This would count as torture if anybody did it to you against your will. And that’s the important factor in boot camp, consent. Not only are recruits allowed to quit, they’re actually encouraged to. “Are you sure you want to be here?” is a common rhetorical question drill sergeants will ask the people who suffer under their instruction. The recruits who want it badly enough wouldn’t quit for anything. Instead of emphasizing the mandatory nature of your training, why not have training that your people actually want to do? Maybe make it optional and focus on encouraging the sort of commitment that will have them do it anyway. You can’t work with folks who don’t want to be there. You might be thinking, “This sure is interesting, but I literally want to send my coworkers to boot camp.” In Japan, you can do just that. Every year, the Japanese military offers 100 or so training camps for companies that want to see what their employees are made of. They also give them first aid training. Some companies put new hires through ‘pilgrimage training’ in which their mobile phones are confiscated and they are left in the mountains to fend for themselves with some food and a map. Others prefer Zen meditation or dance camp. Before you get reported to the HR department for violating countless acceptable workplace practices, recognize that all these examples should be taken as thematic inspiration rather than specific procedural recommendations. Nevertheless, there is something to be spoken for presenting new employees with a challenge to ensure you’re really getting the most out of them. Just make sure you strike the right balance for your company’s culture.